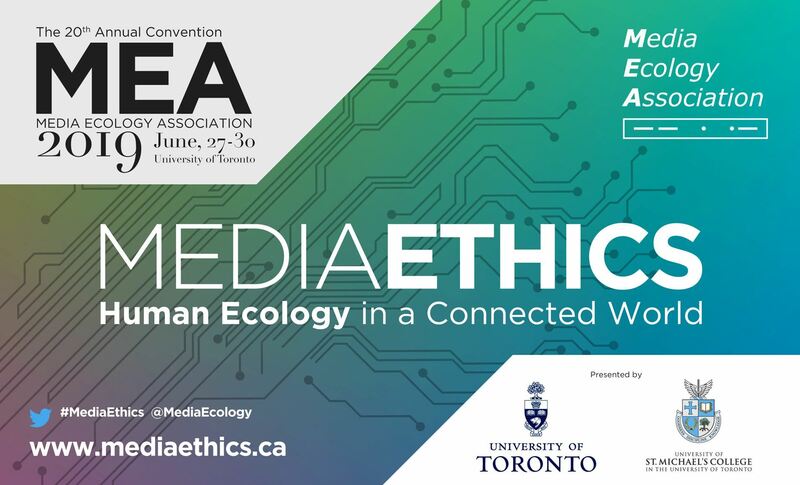 The 2019 Annual Convention of the Media Ecology Association (MEA) — ”Media Ethics. Human Ecology in a Connected World” — will be hosted by the University of St. Michael’s College in the University of Toronto (27–30 June, 2019). Held once a year, the MEA Annual Convention brings together theorists, experimentalists, technologists, and students from all over the world and different disciplines to promote the study, research, criticism, and application of media ecology in educational, industry, political, civic, social, cultural, and artistic contexts, and the open exchange of ideas, information and research among the Association’s members and the larger community. The 2019 theme draws attention to the ways contemporary communication practices and emerging technologies are marked by ethical issues and decisive political, societal, and cultural questions. A pre-convention event will take place on Wednesday, June 26 at 7 PM at the Toronto Reference Library (789 Yonge Street). 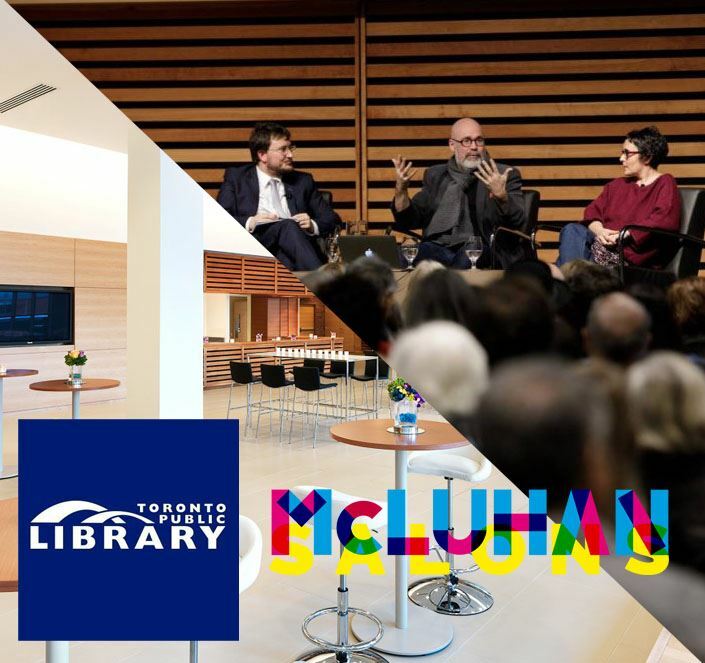 Presented by the library in collaboration with the McLuhan Salons series, the pre-convention event will take the form of a special panel on Civil Society and Digital Capitalism. The event will commence with a moderated probative discussion with a panel of top leaders and thinkers that will also take questions and comments from the audience. It will be followed by a networking event with a special treat for the MEA delegates. For more details and updates, including travel and accommodation information, please visit the dedicated convention website at http://www.mediaethics.ca. The opening ceremony will take place on Thursday, June 27 at 9:00 AM. The Award Gala dinner will take place on Saturday, June 29. The convention program will include seven parallel sessions and around 50 panels or workshops. The majority of the panels will host three or four presentations. In order to be included in the convention program, the deadline for presenting authors’ convention registration is March 31, 2019. Early-bird convention registration until May 15 is for anyone who wants to register early and pay less, regardless of whether they are presenting at the convention or not. All prospective convention attendees are encouraged to join the MEA and pay/register for the convention early as that combination represents the best deal. * Membership is for year (Jan. 1–Jan 1.) and includes an annual subscription to EME, published quarterly, and other benefits. ** Students must show valid student ID upon check-in. *** The awards gala dinner is not included at the daily registration rate. Convention registration entitles you to attend the pre-convention event, all convention sessions, workshops, and plenaries, daily coffee breaks, the welcome reception, and the awards gala dinner (unless you’ve merely purchased daily access). All prices are listed in U.S. dollars. If you paid for your membership and the convention at the same time — e.g., at the early-bird $200 Sustaining Membership level ($100 for an annual membership; $100 for the convention) — you still must register for it specifically by clicking below, though you won’t need to pay for it again. Authors who wish to be considered for the MEA Convention Top Paper Award or the Linda Elson Scholar Award for Top Student Paper must upload their completed manuscript into EasyChair by May 1, 2019. For more, including detailed travel and accommodations information, visit the dedicated convention website. Questions? Contact convention chair Paolo Granta at info@mediaethics.ca.